Official synopsis: "A remix of Charles Dickens’ A Christmas Carol with a Valentine’s twist... When Ben’s girlfriend, Marly, dies, he feels his life is over and the prospect of Valentine’s day without her fills him with bitterness. But then Marly arrives – or at least, her ghost does – along with three other spirits. Now Ben must take a journey through Valentines past, present and future – and what he learns will change him forever. Oh man, I really do not know where to start with this one. I really don't. 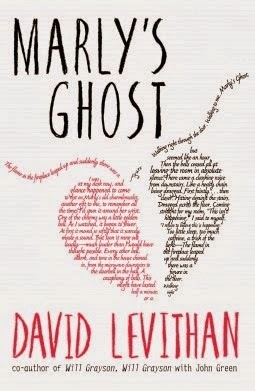 I hate writing reviews like this, I really do, First off, let me say that me and David Levithan have a very, VERY, on off relationship. The first work of his that I read was Boy Meets Boy which I really did not like... Then his second piece of work that I read was Two Boys Kissing and I would never of accredited the two books to the same author. Ever. Two Boys Kissing was life-affirming, incredible, stunning and my favourite book of 2013. So I entered Marly's Ghost with some trepidation, wondering whether this was going to be a repeat of my time with Boy Meets Boy or with Two Boys Kissing. From the start I found Marly's Ghost really jarring. I just couldn't take in what was happening. I struggled to retain information. Dialogue. Key plot points. In fact half way through I had to put it aside and try to recall what I could remember. I know the book is supposed to be, and is marketed as, a remix/rehash of the Charles Dickens classic A Christmas Carol, so I knew this when I started the book. But I didn't expect it to be so similar. Then when I read the author notes/acknowledgements it became clear that this was intentional, that Levithan actually wrote the book whilst reading A Christmas Carol and went through it page by page, paragraph by paragraph... He then proceeded to re-write it to give it a modern twist... But the modern twist is entirely lacking. These are teenagers who we're reading about and yet their dialogue is so jarring, so Victorian and I struggled with this. It just didn't feel right to me and often put me off. Something I also found highly annoying and mildly offensive if I'm honest, is the complete and utter lack of compassion. Four months is a relatively short space of time, especially when you consider that a loved one has passed away. This is a story about first love that ends in tragedy and understandably our male lead, Ben, is grieving and quite heavily. Four months. And yet his friends are treating him like some kind of mad man. Some have given up on trying to include him in their plans while others are either on the cusp of giving up or still willing to put the effort in. I found this quite unsettling. Four months when you lose anyone you love is an INCREDIBLY short space of time, a very raw time that is a minefield of good and bad days, in my experience anyway having lost several family members. I just cannot describe how angry this aspect of the story actually made me. At one point, I actually almost threw my Kindle that I was reading it on across the room. I was so annoyed I didn't care if it broke I just wanted to stop the book there and then - I'm not going to say what point it was because it is a big spoiler for anyone that wants to read the book... Let's just say that it involves the final spirit... Oh man I raged! But I am a believer that if you start something you should finish it, and I don't like putting a book down half way and never finishing it. I always wonder if there might be a redeeming factor lying in wait at the end. Sadly, no. The ending is a sugar-coated sickening shower of love as Ben tries to spread the message that love is great and that you need to move on. I know, as well, that Levithan is well known for his portrayal of LGBT characters but the couple we meet in this book felt so unnecessary. They didn't make sense in the story and the whole thing just felt so off. Overall I think it is safe to say I was disappointed with this book. Greatly disappointed. Part of me wants to attempt another of Levithan's works, I have heard wonderful things about Everyday but I am worried that with my history with his works it'll be a pointless exercise. We shall see.